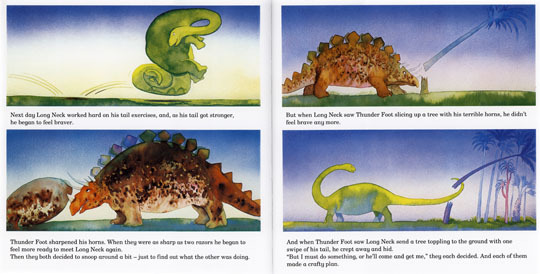 Long Neck is a peaceful sort of dinosaur, so when he spots the stegosaurus Thunder Foot he is immediately afraid of him. Thunder Foot, too, becomes terrified when he glimpses Long Neck at a distance. So the two dinosaurs carefully avoid each other, and nervously practice their fighting skills. Thunder Foot even digs a pit to trap his foe, but they both end up falling in it. A friendship is born.